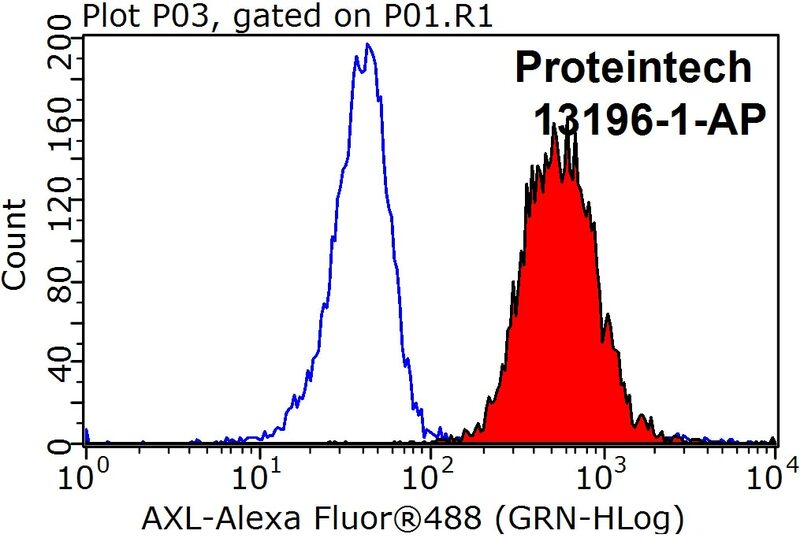 IP Result of anti-AXL (IP:13196-1-AP, 5ug; Detection:13196-1-AP 1:1000) with HepG2 cells lysate 9000ug. 1X10^6 HeLa cells were stained with 0.2ug AXL antibody (13196-1-AP, red) and control antibody (blue). Fixed with 90% MeOH blocked with 3% BSA (30 min). Alexa Fluor 488-conjugated AffiniPure Goat Anti-Rabbit IgG(H+L) with dilution 1:1000. Axl, also known as Ufo or Ark, is a receptor tyrosine kinase of the TAM (Tyro3, Axl and Mer) family. 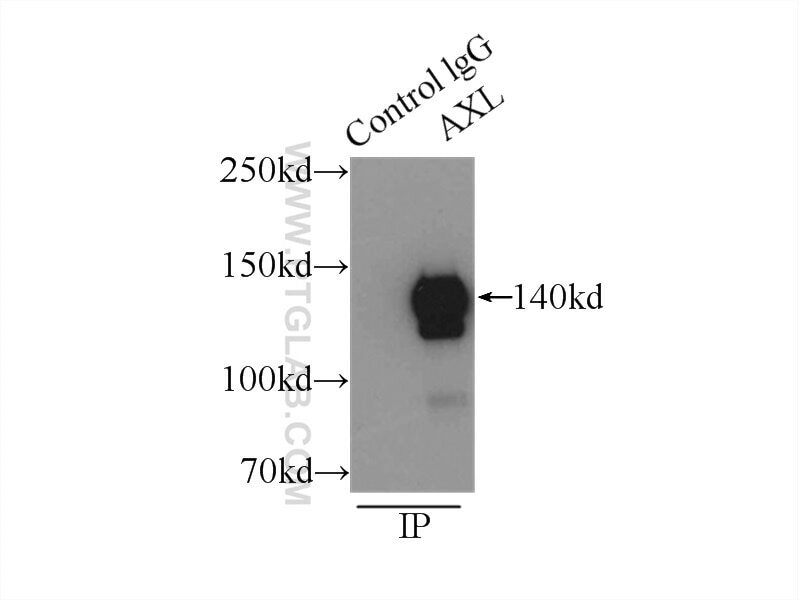 Axl is a single-pass type I membrane protein containing two fibronectin type-III domains, two Ig-like C2-type domains and one protein kinase domain. Axl mRNA is widely expressed with highest levels in the heart and skeletal muscle. Gas6 has been identified as a ligand for human Axl. Gas6/Axl signaling plays a role in cell survival, cell proliferation, migration and differentiation. This antibody detects a single band at 140 kDa, which is considered to represent the auto-phosphorylated form of endogenous Axl (PMID: 12730092). Vitamin K2 regression aortic calcification induced by warfarin via Gas6/Axl survival pathway in rats. Vitamin K2 inhibits rat vascular smooth muscle cell calcification by restoring the Gas6/Axl/Akt anti-apoptotic pathway. Therapeutic Activity of DCC-2036, a Novel Tyrosine Kinase Inhibitor, against Triple-Negative Breast Cancer Patient-Derived Xenografts by Targeting AXL/MET.